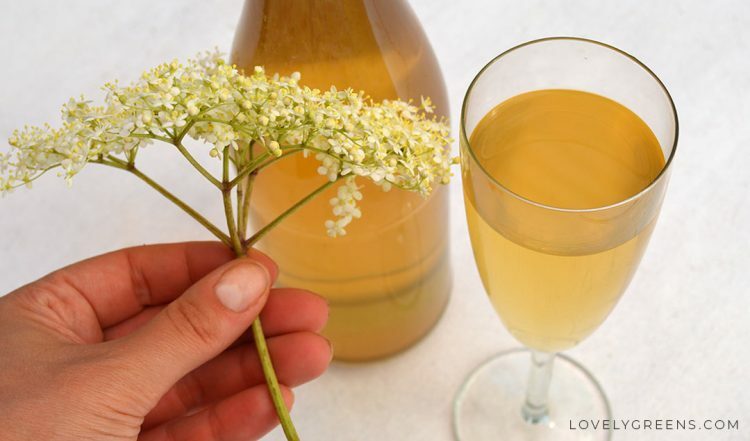 Making elderflower champagne is a lot easier than you’d imagine. 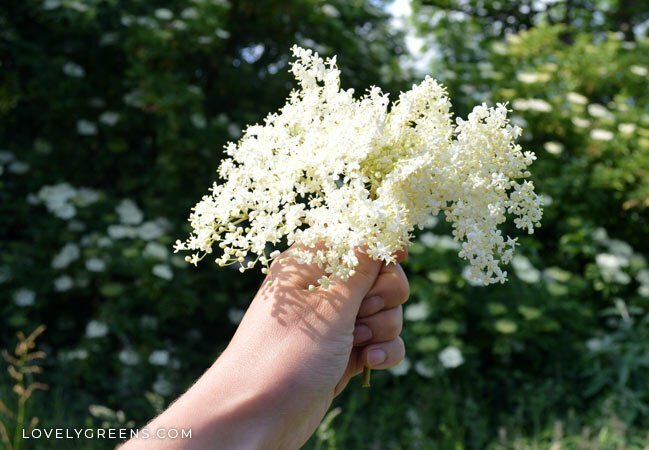 All you need are freshly picked elderflowers, or dried ones in a pinch, champagne yeast and a few other ingredients. 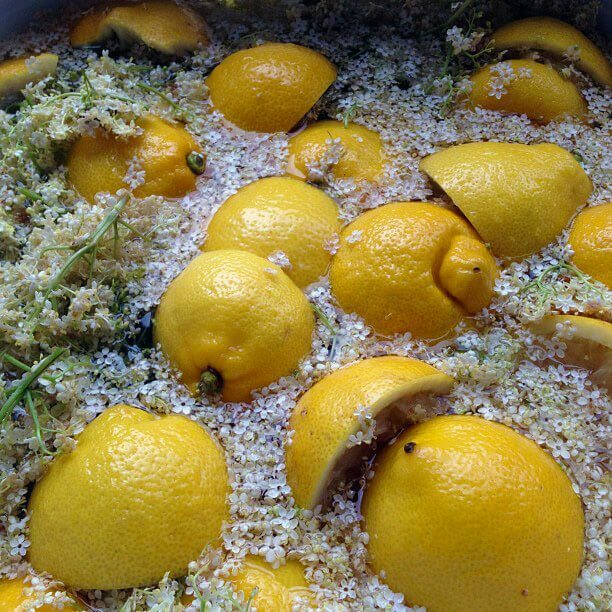 Once this recipe is finished fermenting, you’ll have about six bottles of citrusy and floral elderflower champagne. It’s best served chilled and accompanied by summer sunshine. 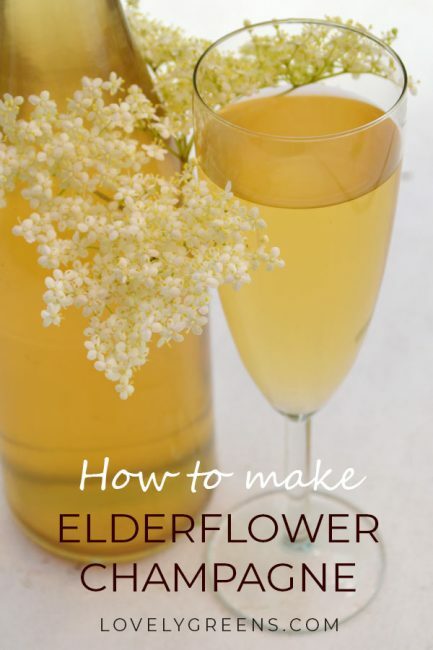 If you’ve not tried elderflower champagne before, you’re in for a real treat. It’s sweet like a dessert wine with a refreshing lemonade-like taste. Once you’ve made it the first time, I guarantee that it will become an annual wild food foraging tradition. 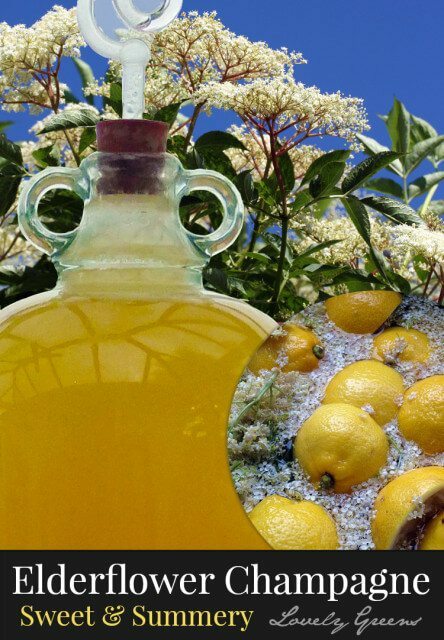 Elderflowers bloom from late spring to early summer in temperate climates. They’re so sweet smelling that you can’t mistake them for anything else, even rowan flowers that look similar. 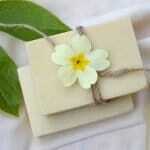 That scent is what gives Elderflower cordial and Elderflower Champage it’s delicious aroma. You’ll find elderflowers blooming a little earlier in warmer areas though and I once came across some in mid April on a trip to Italy. Elder trees grow in semi-sun and you’ll most often find them at the edges of woodland or carparks. 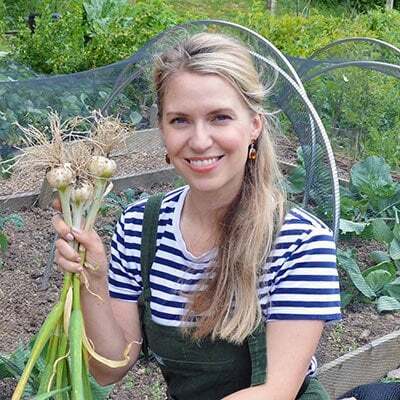 Pluck entire umbels shortly before you plan on making this recipe and make sure that any insects have escaped before starting. 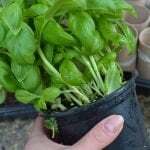 The best way to do this is to set the flowers outside for an hour or two. 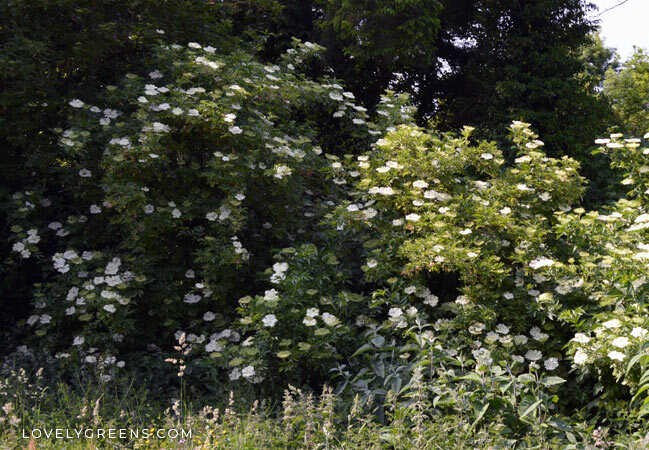 When foraging for elderflowers, make sure to leave enough to form berries later in the summer — for both yourself and for wildlife. 3.75 litres / 15 cups Boiled water, allowed to cool to room temperature. 1. 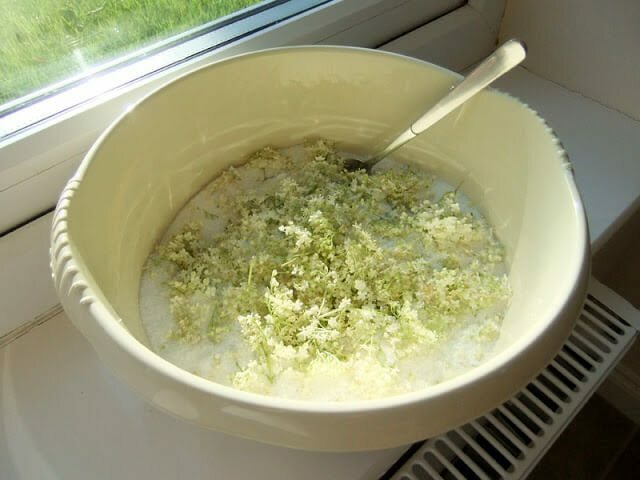 Using a fork, remove all the elderflowers from the stalks and mix in a bowl with the sugar. 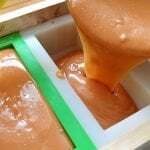 Leave them for 2-3 hours and mash the mixture up with the fork as you mix, every 20 minutes or so. What you’re doing here is infusing the sugar with the Elderflower fragrance and flavour. 2. After the 2-3 hours, add the water and stir until the sugar has fully dissolved. Then add the white grape juice, yeast and yeast nutrient. 3. Halve the lemons and squeeze the juice into the bowl – then toss the lemon halves in as well. 4. 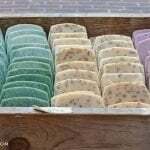 Cover with a clean kitchen towel and leave for 5 days, stirring occasionally. It starts fermenting at this time and if you add it to the demi-john too early it can create a mess. 5. After the 5 days, siphon into a sterilised demi-john (carboy) and fit an airlock to it. Leave the mixture to ferment for about 1-2 weeks or until the bubbles in the airlock slow down to a standstill. You should keep the champagne in a room with the temperature recommended on the yeast packet. 6. Siphon into sterilised plastic drinks bottles after specific gravity 1010 is reached (use a hydrometer) and leave for a few weeks to ferment further. This further fermentation is what will give it it’s fizz! This is also why it’s safer to use plastic drinks bottles because glass bottles, though lovely to look at, can explode if you’re not careful. Section 6 says leave until 1010 is reached. What does that mean. Hi there! The 1010 is referring to the measurement on your hydrometer. It measures the specific density of your liquid and in this case, how much alcohol is in the elderflower champagne. Looks like a recipe to try. Our elder bushes are doing pretty well; growing and spreading. I'm hoping for a whole hedge eventually! An Elder hedge…love the idea! That sounds really good Tanya! 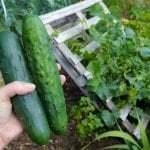 I've been making kefir, fermented vegetables, and kombucha for the last several months. Wine might be next. 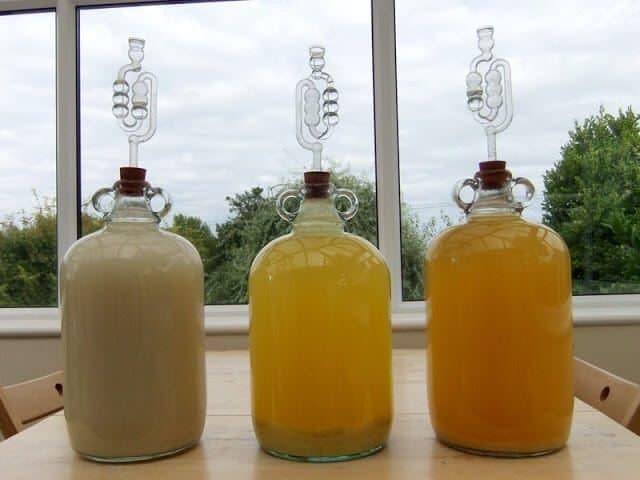 I'm really interested in trying my hand at making mead, and your elderflower champagne sounds really good too. 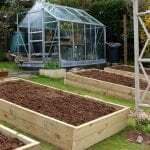 Nice to have you over at Sall's Country Life. We've always wanted to try wine making! May have to try your rhubarb recipe as elderflower is not grown around here. Anxious to tap into more of your blog, I think there will lots of things here I enjoy! I loved watching the TT when I lived on Man – the whole atmosphere on the Island was great.